This makes it possible for the Bruder Real Estate Team will sell your Las Cruces Home for the highest possible Current Fair Market Price, with the Best Terms that can be negotiated, in the most Expedient Manner, and with the Least Amount of Hassle to you. We present our Listing Plan in writing so that you can hold us accountable. Please scroll down to see the details of each step and the entire plan. Discussion and mutual understanding of your selling goals, wants and needs. This will be the basis of your Personalized Listing Plan. Choose an Agent. We will inform you about the various forms of representation (Agency) that we offer, and you can select what best fits your needs. We assure you that we will be accountable to you, and represent your best interests at all times and you will receive “Premiere Service“. Read our written Quality Service Guarantee which lists all the things that we have agreed to do for you. Should we fail to provide the services you want, need and deserve, you will have our Unconditional Listing Contract Cancellation Guarantee. Selling a home is a complex process, but a major benefit of Listing with the Evelyn Bruder Team is that you will never be alone. You will have access to our Team at all times, and we will provide you with Reference Materials and Seller Resources to assist you in understanding all of the subjects we cover in this comprehensive Listing Plan. Proper pricing means listing your home at the Current Fair Market Value. Pricing your home competitively will open the market and draw the maximum number of potential buyers to see your home. More showings equal more offers, and more offers equal a quicker sale at the best possible price. You will receive our “3-Phase Master Market Analysis.” This is the heart of our Price Positioning method of setting an aggressive and reality based price that will ultimately get your home sold. We do not forget the bottom line. We understand that, at the end of the Selling Process, the transaction must provide sufficient funds for you to move on and accomplish your goals. We will provide you with a good faith estimate of Net Funds you will receive based on various possible sale prices. Learn about any issues that might deter buyers or hold up closing by having a professional home Pre-Listing Inspection. You should do the same inspections that a buyer would. Deal with all the inspector’s recommendations both large and small. This Pre-Listing Inspection Information Whitepaper will show you how you will add dollars to your net profit and avoid trouble down the line. 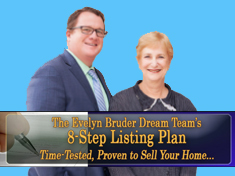 After your home is in tip-top shape, and we are sure that buyers will not find cracks, leaks, or anything else they are going to have to repair later, then the Evelyn Bruder Dream Team will provide you with a free consultation with a staging expert. * The inspection and staging don’t need to be excessively expensive, and the homeowner can do everything that is needed all by themselves. See our detailed, written agressive marketing / merchandising plan including specific strategies, programs and buyer targets. Put a sign and flyer on the property. Put it in the multiple listing service. Put it in the newspaper. We use multiple media to intensively and consistently market directly to all of the top selling agents in Las Cruces. We create enthusiasm about your property and we encourage them to show your home to potential buyers. Our extensive experience gives us the advantage of knowing what Buyers want. We work with you to construct a Listing Agreement that maximizes incentives for buyers. Things like a pre-listing inspection, a home warranty, paying seller closing costs, and include extras as part of the sale, make your home more salable, and more attractive to potential buyers and their agents. Perhaps the most potent marketing tool is our Internet Dominance. Almost all buyers use the internet as part of their home buying process. We are organized, and we have developed a marketing process that will blanket the internet. Your home will be available to be seen on over 300 local, national, and international real estate web sites. Our Marketing section will discuss in detail the exposure and results that we achieve by syndication of your listing, plus the use of multimedia, social media like our Blog, You Tube, Facebook, Twitter and Linkedin. Now that we have done everything from pricing right, to repairs, to staging, and aggressively marketing, it is time to bring in the buyers. We are going to coordinate with you to make your home convenient, easy, and available for Agents to be able to show at all times and we will always be available to assist you or to show the home ourselves when needed. Also we provide you with everything you need to know to stage your home for that unexpected showing. Right from the beginning, we will establish a regular schedule for communication in writing, e-mails, and phone calls. We will update you on our marketing of your home including the number of views of your property from each of our online media. . Every showing of your home will be followed by a feedback that is reported to you. Whenever there are offers to purchase your property, we will provide counsel regarding the offer. We evaluate the qualification of the buyer, and the terms and conditions in the offer. We will provide you with an updated Market Analysis. Act as a trusted advisor working to insure that the final contract contains the best possible price and terms. Another benefit of the Evelyn Bruder Team is that we have our own dedicated transaction managers. We will coordinate all of the inspections, appraisals, and surveys. Insure that all contingencies are removed prior to closing. Make sure that the title company’s paperwork is ready on time for closing. Make sure that insurance, warranties, and financing are all in place. We are available at all times to answer any questions about the contract and the closing process itself.